In 2002 a nationwide student art collaboration was announced. 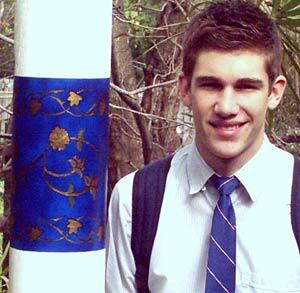 Every one of Australia’s three thousand secondary schools received a letter inviting art teachers to send student concepts for a national SIEVX memorial. The only stipulation was for a design that could be built on the lakeshore of the national capital Canberra. After some anxious waiting, just before the deadline, a flood of entries came in from across the country. They came from as far afield as Christmas Island School across to Invermay Primary in Tasmania, and from prestigious private schools to humble regional high schools. They were powerful, confronting, and beautiful. Many featured hands reaching for help. A pier made of five fingers reaching out welcoming refugees. The hundreds of artworks were exhibited in Pitt St Uniting Church, Sydney, on the 3rd anniversary of the sinking. The memorial service was notable because out of the audience, Amal Basry, a survivor of the voyage called out and was invited forwards, and told the hundreds of listeners about her ordeal in the water. Also present were many of the bereaved families. The next exhibition of the artworks was at Wesley Church in Melbourne, and again was galvanized by the faltering but eloquent speech of survivor Faris Kadhem, who had also simply been sitting at the back of the church, but found himself unable to hold back from telling his story. The 4th anniversary exhibition and service was at Canberra City Uniting Church. At this event, opened by Chief Minister Jon Stanhope, and filmed by TV news cameras, we announced the shape and form of the memorial we were to build. The design, by a fourteen-year-old Brisbane schoolboy Mitchell Donaldson, had been acclaimed by visitors to the exhibits even though we had not sought an actual winner of the project, preferring to let a concept emerge. Mitchell’s design called for the outline of the vessel, with the real dimensions of the boat, formed from poles remembering each person who died. This became the basis of the actual design, adapted because there were so many poles that a procession of poles, incorporating the boat shape, was necessary to fit them in. 353 is a very large number of people, and the impact and scale of loss of life were an important message in the memorial’s role. At the fifth anniversary, we had hoped to place the poles in their lakeside site, for just three weeks. A permanent memorial was seen as some years away, because we wanted to build public support and understanding of the importance of SIEV X in Australia’s history and future direction. Mishandling of our application by the National Capital Authority lead to permission not being granted in time. The bureaucratic difficulties actually helped a great deal, the national media pounced on the story, and every radio interviewer and journalist seemed to believe that the Federal Government had deliberately prevented us going ahead because of sensitivity over the blame for the tragedy. We meticulously refused to speculate; however The Australian newspaper editorialized about conspiracy theorists exploiting the grief of survivors. It was very disappointing for the hundreds of schools and church and other groups not to see the memorial erected. But in a miracle of human collaboration, on the day of the anniversary event, over 2000 people showed up at the lakeside site, where a team of volunteers had organized a complete ceremony involving a procession, and 600 people raised their own and others’ poles. This event was covered on most TV news and major daily newspapers. More people heard about SIEV X that day than in all the years since the sinking. A group of friends based in the Uniting Church, but including many streams of belief and activism, drawn together by Steve Biddulph. Beth Gibbings was the project officer, and Rev. Rod Horsfield the co-founder and elder of the project. The project was helped by many generous specialists in landscape, archiving, community art, education and so on. We especially appreciated the involvement of Dr Sue Anne Ware of the RMIT School of Landscape Architecture, who is an expert on memorial design and execution, and has helped in the planning and permission process.